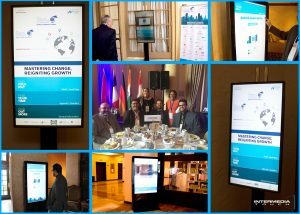 Home » Portfolios » The World Strategic Forum Informs and Guides Guests Using Six Interactive Kiosks with a Custom Wayfinding Solution and Event Agenda. With the ever-changing economic and political environment, the World Strategic Forum organizes and gathers economic leaders from all over the globe to discuss the new opportunities for growth, prosperity around the world. Since numerous leaders and dignitaries attended the conference, the need to provide their guests with the event agenda, information about speakers and a wayfinding tool to guide their guests around the event was essential, and with this, in mind, the WSF contacted Intermedia Touch. 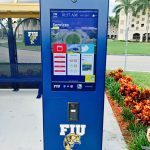 Intermedia Touch rose to the challenge by installing (6) 46″ indoor interactive kiosks strategically located around the event with a custom-made application created with the 22 miles software that included all the expected functions and more! This custom application provided an interactive map that guided their guests thru of the hotel, live schedule updates, and speaker information, inform their guests about the event sponsors and make special announcements. Intermedia Touch is honored to sponsor and provide our services for such an important global event. Intermedia Touch looks forward to supplying our high caliber digital signage and multimedia solutions to our clients. 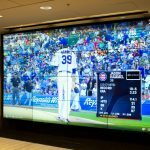 fields, the team at Intermedia Touch, Inc. strives to tailor custom interactive solutions that will create the highest visual impact and relevance for your specific target audience.